The little turkey is adorable. Thanks for sharing. Happy Thanksgiving!!!! This is so adorable and wonderfully designed Maureen. Love this bended card. Thanks. Love your card with the adorable turkey. I do not own a MISTI but I know how life changing it would be after reading all of the MISTI DT member's blogs. Thank you for the opportunity to try to win one and really impact my card making in such a positive way. Mighty cute card ! Thanks for sharing! Super fun card! That turkey made me smile. YAY for perfect sentiment lining up with your MISTI~ I am thankful I found this hobby 20+ years ago! Adorable card! Love how the MISTI works!! Your card is simply adorable Maureen, a great job! Supercute! Happy Thanksgiving to everyone! Cute turkey and Happy Thanksgiving! Really cute card. I love the colors, and the curved affect. Love the card fold you used. Really cute card. I am thankful for the MISTI because it not only helped me be a better stamper but it enabled my Art class students to stamp their own sentiments for their Mother's Day cards that we make in class. I am hoping to acquire more of them so my students won't have to wait so long in line to use it. What a fun card. That little turkey is too cute. Cute turkey. The 3D card fold is great. Cute card.Wishing you a Happy Thanksgiving. Such an adorable little card. I'd love to win the Misti and share with my friend Laura. Best friends since before we began school. Very sweet card, adorable turkey and excellent design. I am thankful for all of the fabulous people in my life. Wow that turkey is so stinkin cute!!! Fabulous card! ADORABLE! Wow great card. Happy Thanksgiving. What a darling card! Happy Thanksgiving! I love your Flexi Turkey card, the googly eyes are great . Such a sweet card! My 4 year old granddaughter is hopping with me and is now dancing while singing how happy this card makes her! She is so right! TFS! Happy Turkey Day! What an adorable turkey. Great card. So adorable! Thank you for sharing! Happy Thanksgiving! I love your card design...it is cool. That turkey looks like he received the pardon!! I am thankful my baking is done and can get to stamping! Your card is darling - I'm a 'put the sentiment on after everything else has already been adhered' type of stamper myself and the MISTI is the best :) Thank you for sharing your inspiration and your tips for using the MISTI. This little turkey is so charming. What an interest take on a card. I'm going to have to look at this more carefully. What a special way to begin the holiday season with a Misti giveaway. You are all so generous. I am grate for all of you who share your ideas with us. I'm very grateful for my husband, cat and friends. Especially the ones who stamp. I have a friend who would be so surprised to become the owner of a Misti. I know she can't afford one and this would be perfect way for her to experience this marvelous new stamping tool. Thanks you for this opportunity and Happy Thanksgiving to you and your family. Cute Turkey. Yes the MISTI is definitely a treasure to be thankful for. Super cute card. Happy Thanksgiving to you and yours. Thank you for being a part of this giveaway. Super cute card! I just saw that type of card for the first time on Pinterest.... I love it! I love this turkey. Thanks so much for the smile you gave me just seeing your card. I am prepping for 24 guests tomorrow for a Thanksgiving feast, and I needed a break and a liltle chuckle and a smile. Adorable card. I like the 3-D effect. Happy Thanksgiving! Very cute turkey card. I would love a MISTI for all my cardmaking projects. What an adorable Thanksgiving card. I haven't tried a bendable card and after seeing yours I want to try it! 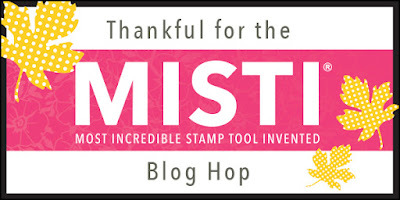 I too, am thankful for the Misti, and how it makes stamping a pleasant activity for creating beautiful and fun cards such as yours. Thank you for sharing. That turkey is just seriously adorable! Great card! Beautiful card. The punch art turkey is super cute. I can see how the MISTI makes it easy to re-ink images when you don't get full coverage the first time. Thanks for the tips. Love the bendy cards. very cute. Love the blog hop and am so thankful for them, I pick up so many cool ideas and information, and have new blogs to follow. Maureen, I always enjoy seeing your card creations. Another great one. This is such a fun card. Love the turkey. Haha, this card made me giggle! Love that fun turkey and unique card fold. Happy Thanksgiving! Your project is lots of fun, a unique fold and the stamping perfect. Maybe someday I will have an e-cutter... I can dream. Love your card! Cute card! Great idea. Thanks for sharing. I am grateful to be able to be on here and see all these wonderful creations! Adorable card. I'm thankful for the wonderful people in my life. Very cute card-love the turkey.I'm so thankful for my family! Super cute Turkey!!! Love him! Adorable card! Love the dimension and the colors and patterns! Fun turkey too! Isn't it great to get to re-stamp the sentiment when you need to? Love that! Such a fun cute gobbler card. Thank you for sharing. What a cute card!! Stamping the saying at the end would be a great benefit that the MISTI could offer. This would make super cute table tags! How cute is this?!? Love it! Your card is awesome, thanks for the great inspiration!! I'm thankful for all the tips and videos you've shared with us, Maureen. Your inspiration sold me on trying a MISTI. Happy Thanksgiving! Such a cute card! Thanks for sharing your talent with us. Happy Thanksgiving to you and your family! Your little turkey is just toooo cute! Interesting fold to this card and that little turkey made me laugh. Lovely card! I'm so grateful for friends! That really is a cute turkey and I love that the card can stand on it's own. Thanks for sharing. would be so grateful to have my very own misty. How adorable! Love the little turkey card!! Adorable card. I love that I can re-stamp and image that didn't stamp properly. My favorite MISTI feature. Adorable card! Love that you can re-stamp an image or sentiment with the MISTI. One great card! I love that I can get my sentiments on perfectly straight! That little turkey is totally adorable! He made me smile. I love that my sentiments are now always straight and dark. Just keep stamping till you're happy! What an adorable card! Would love to win a Misti for my daughter! That is so cute. I hope I win the MISTI so I can make one of these cards. Adorable card! I love the bendy design and the sweet scene you created! The papers and that turkey are so gorgeous! The sentiment is absolutely perfect! The MISTI is definitely at the top of my wish list and I would love to gift one to a crafty sister! Have a very Happy Thanksgiving! are so talented and creative. I am also one of those rare card makers who does not (yet) own a MISTI. I hope that will change soon. Thank you for the giveaway! Now that is one thankful card, love it and of course the Misti. so very cute. Thanks for a chance to win a MISTI! AWESOME Card, I am thankful for my sweet crafting/water exercise friend Michelle! Oh My Goodness! What an adorable card. Thanks for sharing it with us. Don't know what I'd do without my MISTI anymore. Very cool card...what a cute little turkey. I'm grateful for my family and friends, and for my beloved hobby of card-making! This is so cute and clever! Adorable little turkey! such a cute card Maureen! I love my MISTI. Your little turkey is adorable! I use watercolor paper a lot and my Misti allows me to get a great image every time! No more tossing paper away because of blurred images! So cute. I love the way this hugs around. Adorable!! The bendi card is fun!!! What a cute and fun card!! Love the Misti, it's fabulous! Hi Maureen, yes, I love the MISTI too, especially how it saves me from all the frustration I use to experience when I'd mess up a card because the stamping came out wrong. Ugh! No more of that with the MISTI! What a fun card! Yes, I think the waste of mistakes can take all of the fun out of cardmaking. I see that I NEED a MISTI if I want to have fun. Thanks for the chance to win one or two and Happy Thanksgiving! Cute and adorable card. Happy thanksgiving. Your turkey is adorable! The MISTI is the best invention for stampers and crafters EVER! Very cute card!! I love my MISTI, I'm saving for the Memory MISTI now. Awesome card. Your turkey is really cute. I'm a Misti's addict, it's so helpful as I like good and precise stampings ! What a cool 3d card design! I have that style on my to-do list. I'm tickled to have the chance to gift a MISTI to my crafting bestie, Mary, who encourages me so much in my crafting endeavors! Love the turkey, thanks for sharing! So clever. Love the dimension. Happy Thanksgiving Maureen. Love that turkey card... great design. The checkered papers look great with the sweet turkey. I love the MISTI. I have a regular size, but often could use the mini. I am so thankful for my mother-in-law. She holds the family together! What fun I am having blog hopping with new friends! Love the fun turkey! So cute. Love this turkey you created and the card fold. LOVE your FUN turkey and FABULOUS bendi design, LOVE how you stamped your sweet sentiment too!!! Absolutely love your cute turkey card Maureen! I'm so thankful for crafters who selflessly share their talent and I'm grateful for my new stamping friend Renee who would love a MISTI (almost) as much as me. How fun! Thankful for the inspiration! So cute! I am grateful for a husband that accepts my stamping "hobby"! Super cute card! Oh wow so precious. TFS! Hugs and happy Thanksgiving! What a cute card!! I have not tired this fold, but will be today. Thanks for sharing!! So cute. I have never made a card that is so intricate before. Nice. I am thankful for my friend Carole Ebel! She is fun, sweet, and a stamper. I haven't a Misti yet but I'm sure the Misty would make everything so much easier! Crossing my fingers!!! What a cute card and I love your use of the patterned paper. I love the MISTI. such a cute little turkey! Scary to stamp on designer paper, unless you have a MISTI! Adorable! Love the 3D card you created. The Misti is quite a tool! Gobble, gobble. There may only be a small amount of stamping on this card, but it looks like the Misti helped you with perfect positioning. Awesome. Thanks for such an inspiring technique and card. Hope you had a wonderful Thanksgiving and happy stamping! Sweet turkey card... Thankful for Miss Sweet Petunia for inventing the MISTI. Thanks for the chance to win a MISTI for myself and my friend. Very grateful! Super cute card! And perfect sentiment placement, of course! Love Lori Whitlock and your card. Love that you're able to assemble such an adorable card and how you incorporate the MISTI. I have this tool on my Christmas Wish List but to win one for me and one for my friend would be completely AWESOME. Wishing all the best! I absolutely love punch cards and your little turkey is the cutest! Thank you, Maureen, for sharing your talent! Darling card! Isn't great not to have the fear of a mis-stamped sentiment messing up your card? I know I am thankful for that. I would love to share a MISTI with my dear friend, Teri. This spunky little turkey is adorable! I haven't even tried a misti so would love to win. If it makes my stamping better, I think I need one!